I’m really good at being a picky eater. That’s been true my whole life. There are certain foods that I never eat and ingredients I always avoid. But, I’m not good at counting calories. I have no idea at all how many calories I consume in a day. I’m completely in favor of eating on the light side, choosing whole grains over refined flour when possible, and minimizing my sugar intake. So, it’s handy to have a good cookbook for lightened up dishes with lists of how many calories, and specifically what types of calories, are in recipes. Virginia Willis’s latest book, Lighten Up, Y'all , does just that, and I received a review copy. This book takes several classic Southern dishes and reworks them into lighter versions. Every recipe has information about total calories per serving and how many grams of fat, carbohydrates, fiber, and protein there are. Saturated fats have been reduced and at least partially replaced by unsaturated, sodium has been cut, and sugar quantities have been slashed. The tip for keeping the calorie count in check that I’d rather not follow is the one about reduced fat cheeses. Going back to that thing about me being a picky eater, I try to only buy cheeses that are certified organic or that are definitely made with milk from animals never given antibiotics or hormones. In several recipes in the book, either reduced fat cheese or a mix of regular and reduced fat is called for. When I’ve tasted those kinds of cheese, the flavor just isn’t there, and they tend to be made by large companies that don’t guarantee anything about the quality of milks used. For me, I’d rather cut calories elsewhere. What I can’t complain about at all are the Buttermilk Biscuits I baked one Sunday morning for breakfast. They’re made with some whole wheat pastry flour mixed with the all purpose and some unsaturated canola oil mixed with the butter. They were tender and delicious. The Multigrain Pecan Waffles with no sugar in the batter are on my list to try next. There’s a Red Snapper Provencal with Stone-Ground Grits dish and Creamed Corn-Stuffed Tomatoes that doesn’t actually have any cream that I want to make. From Starters through Sweet Indulgences, there are great-looking recipes for every course. 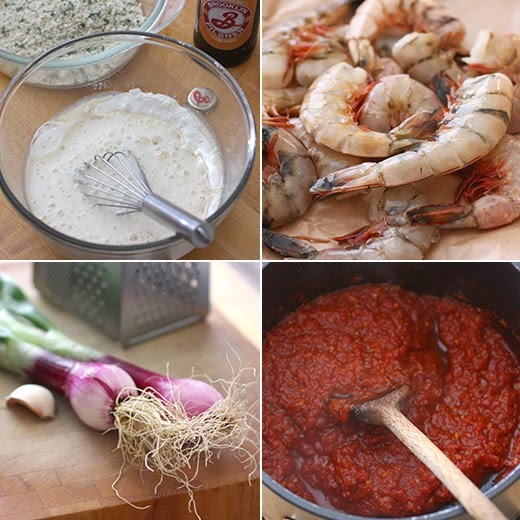 Beer-Battered Shrimp was an easy choice for the first recipe to make from the book. I always love shrimp, especially when it’s crispy. I have to admit though, the real reason I wanted to make this was because of the homemade spicy ketchup. In my effort to rein in my sugar consumption, I sometimes skip regular ketchup. Here, the homemade version is made with just one tablespoon of honey and no refined sugar. To make it, some olive oil was heated in a saucepan. Grated onion was added and cooked until softened, and minced garlic was added. Next, canned whole tomatoes that had been pureed were added along with tomato paste, sherry vinegar, honey, smoked paprika, and a little salt. The mixture was cooked until thickened, about 45 to 60 minutes. The shrimp were cleaned and deveined. Then, a batter was made with beer, rice flour, all purpose flour, and baking soda. 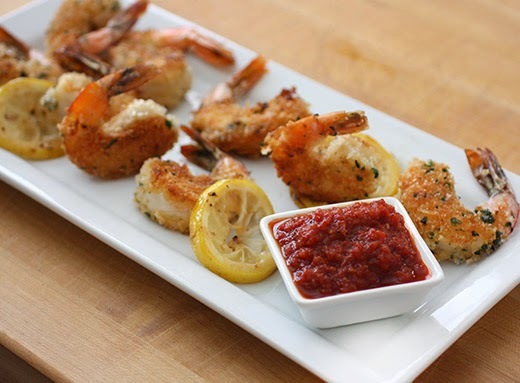 The shrimp were dipped in the batter and then coated with panko breadcrumbs mixed with chopped cilantro. The shrimp were shallow fried in just enough canola oil to coat a skillet, and lemon slices were seared in the hot pan when the shrimp were removed. 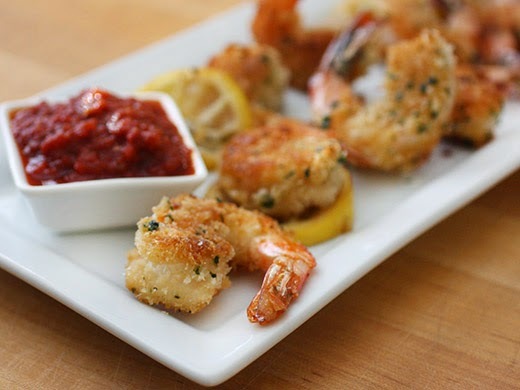 The beer batter and panko crumbs made the shrimp extra crispy. And, the smoky, tangy homemade ketchup was delicious for dunking the shrimp. I put some extra ketchup in the freezer so I can pull it out some time later for oven fries or veggie burgers. I still won’t be any good at counting calories, but this book has given me several new ideas for eating light without sacrificing flavor. I have to warn you, I’m going to gush a bit here. A new book has come along that’s not only about one of my most favorite food topics but is also full of interesting information I’d never read before on the subject. The book is Pasta by Hand by Jenn Louis, and I received a review copy. Even Mario Batali, who wrote the foreword, hadn’t tasted or heard of several of the recipes in this book. Now to explain, the “pasta” in the title refers to traditional handmade dumplings or variations on gnocchi from different regions in Italy. Jenn Louis researched the topic at her home in Portland and then traveled from region to region in Italy to learn everything she could about dumpling making. In Italy, these handmade morsels of dough are always called gnocchi with some regionally specific names for certain shapes. For Italians, the word dumpling is thought of only in terms of Chinese-style stuffed dough shapes. However, gnocchi translated to English is dumplings. 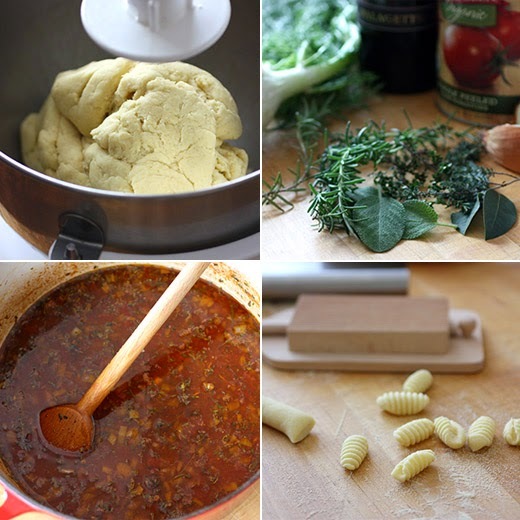 Whether it’s pasta, gnocchi, dumplings, or any other name, they all look delicious and fun to make. I didn’t actually flag any pages in this book as I usually do to quickly flip back to recipes I want to make. That’s because I will eventually make every type of pasta or dumpling described. I truly love working with pasta doughs of all kinds and figuring out how to form the desired shapes. A yeasted dough is used to make Cecamariti which comes from Lazio, and the dumplings are shaped like little green beans with pointy tips. Orecchiette, from Puglia, is a shape I’ve never tried making but have wanted to for the longest time. It’s traditionally made with semolina or regular wheat flour, buckwheat flour, or burned wheat from fields that were burned after harvesting. There are potato gnocchi versions as well as ricotta ones; two versions with beets; some have chestnut flour; one has winter squash puree in the dough; and the Gnocchi Alla Bismark dough includes finely chopped prosciutto, cinnamon, and nutmeg. For each type of dumpling, there are suggestions for best sauces to pair with it. And, there’s a chapter for sauces at the back of the book. 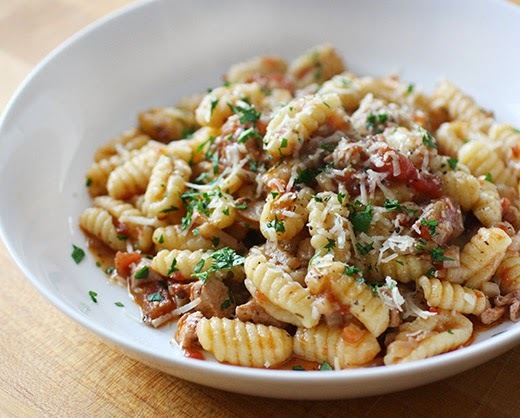 I decided to make Semolina Cavatelli for Easter, and since I have a curious habit of eating rabbit at Easter-time, I paired the cavatelli with the Rabbit Ragu. It all started a few years ago when I was out for dinner with my family on the night before Easter. I ordered the rabbit. I ate the Easter bunny on the night before Easter. Two years ago, my birthday fell on the day before Easter. When we went out for dinner that night, I did it again. What can I say? I can’t resist a theme. So, rabbit was on the menu for our Easter dinner this year. The only problem was that the recipe calls for ground rabbit, and after too many phone calls to count to butcher shops and meat counters around town, I learned that I can’t get ground rabbit in Austin. I bought a whole rabbit from Countryside Farms at the farmers’ market, removed the bones, and chopped the meat myself. But first, I started by making the cavatelli a couple of days in advance. It was easier than I expected and really, really fun. Boiling water was mixed into semolina flour with salt and olive oil in a stand mixer. The dough was then kneaded by hand briefly and then left to rest for 30 minutes. With small pieces of dough at a time, long ropes were rolled by hand and cut into half-inch lengths. Those half-inch bits of dough were rolled off the thumb on a ridged gnocchi board. The dough is just stiff enough to curl up around your thumb and form a little curved shape. It was like the dough just knew what to do all by itself. I stored some of the cavatelli in the refrigerator that was going to be used that weekend, and the rest was placed on a sheet pan and set in the freezer. Once firmly frozen, the cavatelli can be transferred to a bag to store in the freezer. Making the rabbit ragu was simple once I had the rabbit meat prepped and ready. I did skip the pancetta in the recipe and started by cooking the onion, fennel, rosemary, sage, thyme, bay leaves, and red pepper flakes. Pureed, canned tomatoes were added and left to simmer before red wine and chicken stock were added and simmered until reduced. The chopped rabbit cooks quickly and was added at the end and only cooked for 10 minutes. To serve, enough ragu for each serving was heated in a saute pan with some added butter. Cooked cavatelli were added to the sauce to finish cooking and become coated. Parmiggiano-Reggiano was sprinkled on each serving. The semolina cavatelli are sturdy but tender at the same time. They hold their shape well but take on a nice texture after being cooked. The only thing better than making the pasta, was eating it. The ridges and curled shapes held the ragu well, and I was delighted with the rabbit in the sauce. I still have more cavatelli in the freezer that might get paired with a simpler tomato sauce next time. And then, I’ll be coming back to the book to try all the other dumpling shapes. Recipe reprinted with publisher's permission from Pasta by Hand . 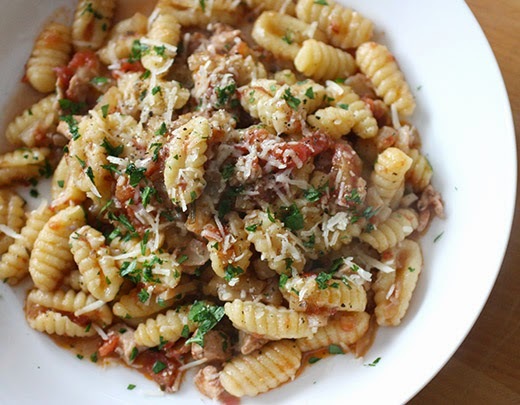 SAUCE PAIRINGS: Traditionally, semolina cavatelli are paired with Tomato Sauce, Rabbit Ragu, Lamb Ragu, or Beef Ragu. Rabbit is as common in Italy as chicken is in the United States. At Lincoln, this ragu is a staple. We buy whole rabbits and use every part: the bones are made into stock, the fore- and hindquarters are used for an entree, and the loins and bellies are ground for ragu. Often we also use the livers, heart, and kidneys when making ragù; they add great richness and flavor. If finding ground rabbit meat is challenging, check with a local farm, Italian market, or specialty butcher, and ask specifically for medium-large grind (if the rabbit is finely ground, it will cook too quickly and toughen). This sauce is well worth the effort. In a large heavy-bottomed pot, warm the olive oil over medium-high heat. Add the pancetta and cook until the fat renders and the pancetta barely begins to brown, about 4 minutes. Add the onion, fennel, rosemary, sage, thyme, bay leaves, and red pepper flakes and cook until the onion and pancetta are soft and slightly caramelized, 3 to 4 minutes. Add the tomatoes and stir to combine. Turn the heat to low and cook until the tomato thickens and begins to caramelize, 5 to 7 minutes. Stir in the red wine, raise the heat to medium-low, and cook until the wine is almost completely evaporated, 2 to 4 minutes. Stir in the chicken stock and simmer very gently until the sauce is reduced to about one-third, about 20 minutes. Add the rabbit to the sauce, stirring to break up any lumps, and simmer just until the meat is soft, tender, and cooked through, about 10 minutes. Rabbit is lean, so it does not require much cooking time. Season the sauce with salt and pepper and discard the herb sprigs and bay leaves. To finish dumplings with the ragu, for each serving, warm 1/2 cup (120 ml) of ragu in a saute pan over medium heat and add 1½ tsp to 1 Tbsp butter per serving, depending on how naughty you feel. Gently simmer about 4 minutes, until the bubbles get large and the sauce is not watery along the edges of the pan. Add the cooked dumplings and simmer for 1 minute to let the dumplings absorb the flavor of the sauce. Spoon into serving bowls and top with grated Parmigiano-Reggiano cheese. Serve right away. These days it’s becoming more and more likely that when you bring baked goods to a party or other event, you’ll encounter several guests who need to know what ingredients were used and if they need to avoid the item in question. I’ve been trying to bring optional offerings to events when possible like gluten free, dairy free, vegan, etc. The latest book from Gesine Bullock-Prado will make this much easier. Let Them Eat Cake is another treat-filled, fun book just like all her others, but this time, every single recipe also has three additional variations to make it vegan, gluten free, or healthier. I received a review copy. Vegan versions, obviously, replace all animal products with plant-based ingredients. So, eggs are replaced with flaxseed meal or a vegan egg replacer product, honey is replaced with agave syrup, and butter is replaced with a vegan butter substitute. Gluten free versions swap out wheat flour for other varieties, and the liquid quantities may change. For the healthier options, the primary changes include using some whole wheat pastry flour in place of all purpose, using organic coconut palm sugar instead of granulated, and in some cases, using some pureed fruit in place of some of the fat. It’s so convenient to have all these options in one place for each recipe. The recipes themselves are classics like we’ve come to expect from Gesine. There’s a checkerboard Battenberg cake covered in marzipan; a Key Lime Double Rainbow Cake with six shades of yellow and orange among the layers; and a Lemon Chiffon Strawberry Cake with mint and almond pastry cream, strawberry coulis, and cake layers. There are also cookies, quickbreads, pies, ice creams, and candies. The little pop tarts on sticks are too cute to resist, and I need to make the Killer Coffee Cake soon. But first, I had to make some cookies. The Starry Starry Nights are described as a chocolate truffle in cookie-form, and they’re already gluten free in the original recipe. This is a simple-enough cookie to make, but the process does require planning for chilling at two different stages. It’s made with almond flour and no other flour, so there’s no change for an option with no gluten. To start, eggs, coconut palm sugar, and honey were combined in a stand mixer. Chopped 70% cacao chocolate was melted with some butter in a double boiler and left to cool. Almond flour, cocoa powder, and salt were combined in a separate bowl. The melted chocolate was added to the almond flour mixture and stirred to combine. The whipped egg mixture was added in parts to the chocolate mixture. The first quarter of the egg mixture lightened the chocolate mixture, and the remaining egg mixture was gently folded in. Once mixed, this was covered and refrigerated for at least two hours. The mixture needs to be firm enough to scoop just like making truffles. When the batter was chilled and firm, small balls were scooped and then rolled in sugar before being placed on a parchment lined baking sheet. The scooped cookies can be placed close together here since they’ll be chilled in the freezer before baking. When all the cookies were formed, the sheet pan was covered with plastic and placed in the freezer for a couple of hours. They went almost straight from the freezer to the oven with a short stop for a second coating of sugar before being spaced farther apart on a baking sheet. They baked for about 10-12 minutes. For the second coating of sugar on the cookies, I used demerara sugar for the big, crunchy crystals. That also made my Starry Starry Nights have more of an amber-hued twinkle, but they were still glittery. Calling these baked truffles is exactly right. This is the perfect cookie for chocolate lovers, and each one packs a lot of flavor into its small size. Now, when I need to offer multiple options for baked goods or if I ever need to make a vegan caramel sauce, I know where to look. Recipe reprinted with publisher’s permission from Let Them Eat Cake . You know what I love about these cookies? They are the most delicious and chocolaty treats you’ll ever eat. And they’re gluten free from the get-go. 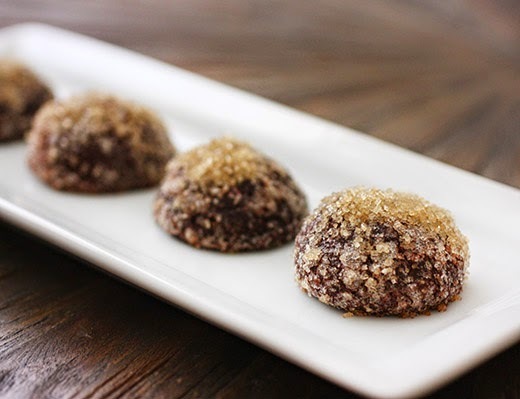 When I first created them in 2004, it wasn’t my intention to make a gluten-free cookie; I just wanted to get as close to a “baked truffle” as I could muster. I wanted a cookie that you could keep around for your chocolate fix but that wouldn’t melt like a chocolate truffle. You can freeze them for up to a month after baking and just pop one in your mouth when you need a fix! In the bowl of a stand mixer fitted with the whisk attachment, combine the eggs, 1/4 cup (50 g) of the sugar, and the honey. Mix on high speed until the mixture ribbons thickly. Put the chocolate and butter in a heatproof bowl and set it over a saucepan of simmering water (to make a double boiler) until melted. Let cool slightly. 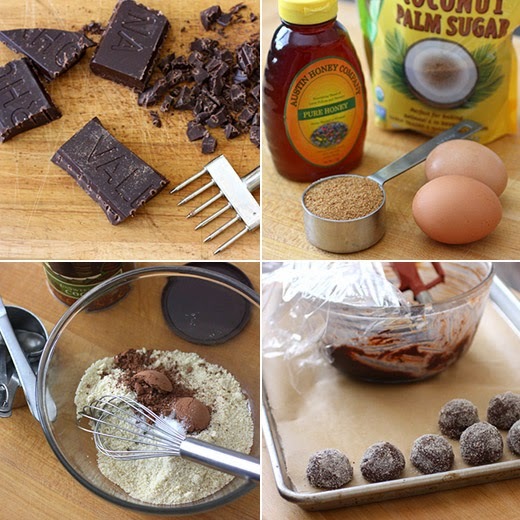 In a small mixing bowl, whisk together the almond flour, cocoa powder, and salt. Add the melted chocolate and stir well. Add one quarter of the egg mixture to the chocolate to lighten it, stirring with a wooden spoon until no egg streaks are visible. Add the remaining egg mixture and gently fold with a large rubber spatula until completely incorporated. Cover with plastic wrap and chill until firm, 2 hours to overnight. It is imperative that the mixture is incredibly firm. Put the remaining 1/2 cup (100 g) sugar in a small bowl. Fill a heatproof mug with very hot water. Line a sheet pan with parchment paper. Using a teaspoon cookie scoop or a melon baller, first dip the scoop in the hot water and then scoop out a round of batter. 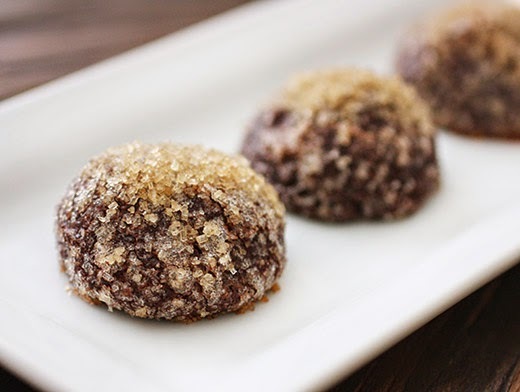 Roll the ball in the sugar, then place it on the prepared pan (you can space them very close together to freeze; you will use another sheet pan to bake off). Continue to scoop and coat the balls. Cover the sheet pan with plastic wrap and freeze for 1 to 2 hours. Line another sheet pan with parchment, remove the cookie-filled sheet pan from the freezer, re-dip each cookie in sugar, and place the cookies 1 inch (2.5 cm) apart on the new sheet pan, placing any cookies that didn’t fit onto the sheet pan back in the freezer until their turn in the oven comes. Immediately bake for 10 minutes, turning the sheet pan after 5 minutes. The cookies will look slightly cracked but the sugar will not be browned when they are done baking. Replace the sugar with 3/4 cup (130 g) organic granulated palm sugar or 3/4 cup (110 g) Sucanat.